What on earth are Bob Stannard and Todd Bailey up to? In a letter filed Wednesday with the Vermont Secretary of State's office, the two liberal lobbyists announced their intention to start what they're calling Vermont's first "super PAC." Unlike traditional political action committees and advocacy organizations, the new Priorities PAC intends to "raise individual, corporate and labor funds in unlimited amounts" and engage in direct electioneering efforts in Vermont, according to the filing. Who's behind this shadowy outfit? A bunch of lefties who earlier this year founded Vermont Priorities, a nonprofit focused on fighting for universal health care, the environment, a progressive tax system and other hippie-dippie causes. 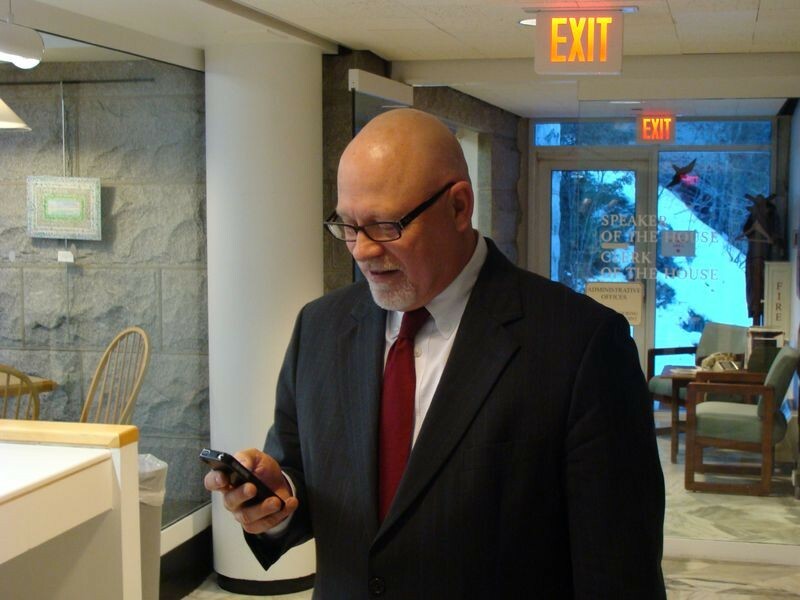 Stannard (pictured above at the Statehouse), an anti-nuke lobbyist for the Vermont Citizens Action Network, chairs Vermont Priorities' six-member board. Bailey, a lobbyist for KSE Partners, serves as the group's consultant. "Why is somebody vehemently opposed to super PACs starting one? Well, that's a good question. I don't like super PACs. I don't like the obscene amount of money that's being dumped into politics around the country," Stannard says. "But I'm simply not going to sit back and watch 40 years of sound legislative practice in Vermont get rolled." Early press coverage of the group has focused on this ironic, yet seemingly heroic mission: As Stannard puts it, "When you think about it, people who hate super PACs are starting a Super PAC, one of whose main goals is to get rid of super PACS." But that's not Vermont Priorities' only goal, Stannard says. The group plans to campaign on behalf of Vermont politicians who support a whole host of liberal priorities. "We have not fully come forward with our agenda yet," he says. "We will be advancing issues that are important to the majority of Vermonters." So, wait. Hold on. A couple of lobbyists start a super PAC that'll rake in money from corporations and one-percenters and spend it to advance an ill-defined ideological agenda? And that's a good thing? "I don't like the game. I don't like the rules of the game. But there are those who really do," Stannard says. "The obvious characters come to mind: people like Karl Rove and his friends the Koch brothers." Oh, I see. It's cool because they're lib-relz! And they just hate super PACs! And they're going to stop mean old Karl Rove and the dreaded Koch brothers! Have the big, bad conservative Super PACs found their way to Montpelier yet? No, concedes Stannard, but better safe than sorry. "We could wait until those who might not be in sync with us start a Super PAC and we would be on the defensive and scrambling," he says. "We're being defensive by being offensive is how I'd couch it. Are we encouraging others to start a super PAC? I don't know." According to Bailey, the purpose of the group's filing on Wednesday is to test the waters of state election law following a pair of recent court decisions appearing to confirm that super PACs can operate in Vermont state elections: the U.S. Supreme Court's repudiation of Montana's campaign finance laws and Vermont U.S. District Court Judge William Sessions' ruling in Vermont Right to Life v. Sorrell. Secretary of State Jim Condos on Wednesday said he's reviewing the organization's filing "to see how super PACs fit into state statutes." Attorney General Bill Sorrell, meanwhile, says his office has already launched a review of the filing and plans to issue guidance on the matter next week. Though he declined to predict the outcome of the review, Sorrell says it's clear the recent decisions bode poorly for keeping unregulated money out of Vermont politics. "Let me put it this way: I think there are a number of unfortunate developments federally as it relates to campaign finance laws both in federal elections and now — after the Montana case — in state elections," he says. "I don't think anyone can take a real hard look at the Montana decision and say, 'Oh boy, that was a great decision for state sovereignty in the campaign finance arena.'" By confirming that super PACs are legal in Vermont, though, aren't Stannard and Bailey showing the nefarious groups they oppose a path forward in the state? "I think the pathway is pretty clear for everyone. This is not providing cover for other PACs," Bailey argues. "This is a grassroots organization seeking clarity, not a million-dollar ad buy from Karl Rove or the Koch brothers." But if Vermont Priorities is truly a grassroots organization, why doesn't it just follow existing regulations, which cap donations to PACs at $2000 and limit contributions from PACs to candidates to $6000 per election cycle? "I think that the answer to that is really how aggressively the entity can advocate for specific candidates during an election," Bailey 'splains. "It is extremely difficult to spread the message broadly when you're limited to $2000 contributions." Never fear, people-who-are-not-corporations. Surely our Citizens United-hating politicians here in the Green Mountain State would forswear the support of a liberal super PAC, right? "Well, it's something we'll have to look at if and when it arises," Sen. Bernie Sanders told Seven Days' Andy Bromage in February. "It would totally depend on what the organization was all about," the AG says, hypothesizing that a super PAC focused on environmental issues might find his record so compelling that it would support his candidacy. "I'd be kind of foolish to say I don't want their support." How about Gov. Peter Shumlin? After all, he said in June that the Citizens United decision, "has allowed for exorbitant corporate spending through super PAC structures, which is playing an increasingly large role in determining the outcome and tone of political campaigns." Surely he wouldn't accept Priorities PAC's support, right? "While the governor would prefer that all super PACs stay out of Vermont, the Supreme Court decision allows for such spending," spokeswoman Sue Allen said in a statement Thursday. "Given that reality, and the massive spending by opponents of the president that we are already seeing in the presidential race, the governor understands that progressive-minded groups cannot unilaterally cede the airways to their opponents." With friends like these fighting to keep super PACs out of Vermont, who needs Karl Rove and the Koch brothers?